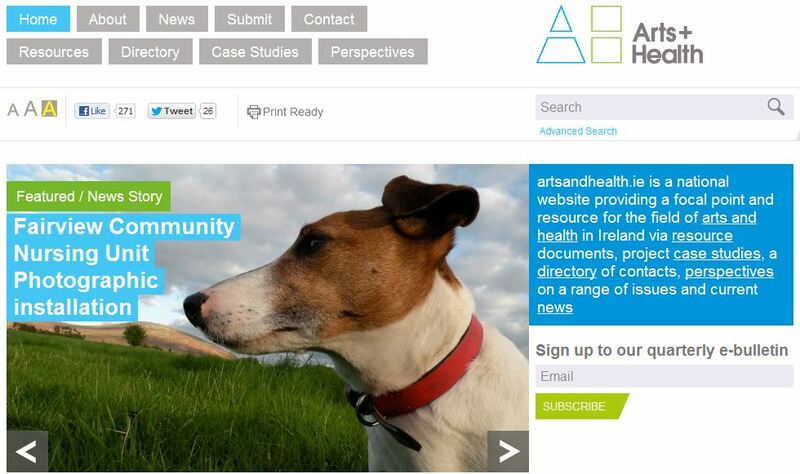 Artsandhealth.ie is a national arts and health website developed by the Waterford Healing Arts Trust (WHAT) and Create, the national development agency for collaborative arts in social and community contexts.The development phase of the website was funded by the Arts Council. The website provides a resource and focal point for the field of arts and health in Ireland via information, support, advice and news, and generates discussion between artists, arts organisations, health service users, carers, healthcare professionals and others interested in the dynamic area of arts and health. Sarah Searson was commissioned by the project partners CREATE and Wateford Healing Arts Trust to mentor and make recommendations for the future governance of the website to ensure long term, transparent and and to support the project partners with workable structures. The website development was directed by Mary Grehan, Arts Director of WHAT and Sarah Tuck, Director of Create and Claire Meaney of WHAT is the Project Co-ordinator / Moderator. At the inception; the projects editorial panel comprised of Ciara McMahon, GP and artist, Aidan Warner, Community Department HSE South (Cork), Lucina Russell, Arts Officer, Kildare County Council, Nicola Dunne, Arts and Wellbeing Specialist with Kildare West Wicklow County Addiction Team, Helene Hugel, Artistic Director of Helium, Katrina Goldstone, Communications, Create, and Jo O’Rourke, Senior Health Promotion Officer, HSE. An Arts and Health Policy and Strategy published in 2010 by the Arts Council identified the need for a single and independent resource to meet the current and evolving needs of those involved in arts and health.